Religion, not Racism, Maintains Southern Distinctiveness; Democrats Could Make Inroads in the South by Angie Maxwell, Ph. D.
One of the primary purposes of the Blair-Rockefeller Poll was to collect data that would allow researchers to compare the southern region to the rest of the country. While many national surveys include only small samples from the South, the Blair-Rockefeller Poll oversampled southerners of all races and weighted the data to reflect a true national portrait by race and region. Thus, rather than assessing the region based on the opinions of relatively few southerners (white southerners specifically), the Blair-Rockefeller Poll provides an accurate snapshot in time of the South and the Non-South. Choosing Knowledge Networks to conduct the survey also allows the Blair-Rockefeller Poll to bridge the digital divide that is particularly pronounced in parts of the American South. The 2010 Blair-Rockefeller Poll reveals relatively little difference between southerners and non-southerners overall, with religion serving as the primary exception. When asked a battery of political sophistication questions regarding the positions that certain people hold in the American government, southerners and non-southerners were virtually indistinguishable. In general, little, if any, regional divide exists in unemployment rates or in personal views about the economy (Table 1). Additionally, when asked if they expected their personal financial situation to be “worse off” in the next year, 20.4 % and 20.3% of southerners and non-southerners respectively agreed. Moreover, when asked whether they believed that things would get much or much worse for the country, 35.9% of southerners agreed, with 35.7% of non-southerners responding in kind (Table 2). 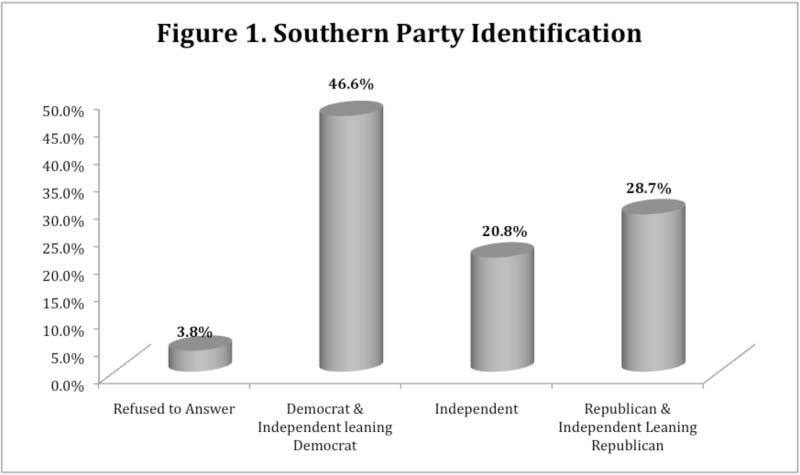 In terms of party identification, a slightly larger percentage (28.7%) of southerners identify as Republicans, as compared to 26.3% of non-southerners (Figure 1). Identification with the Democratic Party still dominates in both regions (46.6% in the South and 51.2% in the non-South). The gap widens a bit when respondents were asked to define their ideological perspective, with 34.8% of southerners choosing the “conservative” label compared to 31.7% in the non-South. Where the regional gap may be particularly instructive is in voter turnout, with the non-South reporting a 5.6% greater 2010 midterm turnout than the South (Table 1). Scholars of the South have focused much effort on understanding how the once solidly Democratic South realigned with the Republican Party during the second half of the 20th century. The “Southern Strategy” employed by Richard Nixon (building off successful inroads made by Republican President Dwight D. Eisenhower and Republican Presidential nominee Barry Goldwater in the 1950s and 1960s), used racially polarizing issues to drive white southerners into the Republican Party. Sometimes classified as a 2nd “Southern Strategy, “socially conservative” issues were used in the last three decades to align evangelical southerners with the Republican Party in a similar fashion. Demographically, religion and, specifically, one’s view of the Bible remain the key distinguishing factors between the South and the non-South, with 81.5% of southerners identifying with some denomination of Christian faith, as compared to 76.4% of non-southerners (Table 1). Moreover, 41.4% of southerners indicate that they hold a literalist view of the Bible as compared to 31.5% of non-southerners. This specific view and its stronger presence in the South may also account for the regional gap in other responses. When asked whether or not it was important to be Christian in order to be considered “fully” American, 27.7% of southerners gave the most extreme response of “very important” compared to 20.9% of non-southerners (Table 2). Additionally, religion continues to create a gap among southerners and non-southerners on issues deemed “socially conservative,” such as gay marriage (Table 4). While religion still creates a divide between the South and the non-South, racial attitudes show little regional distinction despite the South’s racial history. Limiting the poll sample to Whites only provides a more detailed comparison between the South and the non-South. Specifically, southern Whites and non-southern Whites show similar responses (less than 3% difference) to questions regarding job, school, housing, and health care equity for minorities (Table 3). One general question asked respondents whether or not they agreed with the following statement: “We have gone too far in pushing equal rights in this country.” This question revealed a larger gap of 3.7% with more non-southern whites “agreeing” or “strongly agreeing” with the statement than southern whites. With less than half, and at times less than one-third of Whites believing that the federal government should help facilitate equity in jobs, education, housing, and healthcare, clearly racial consciousness and prejudice remains a seminal factor in policy preferences and political attitudes (Table 3). However, the Blair-Rockefeller Poll suggests that such racially influenced preferences and attitudes are not regionally specific. Southerners in general do report higher disapproval ratings of President Barack Obama (19.5% strongly disapprove) than non-southerners (14.4%). 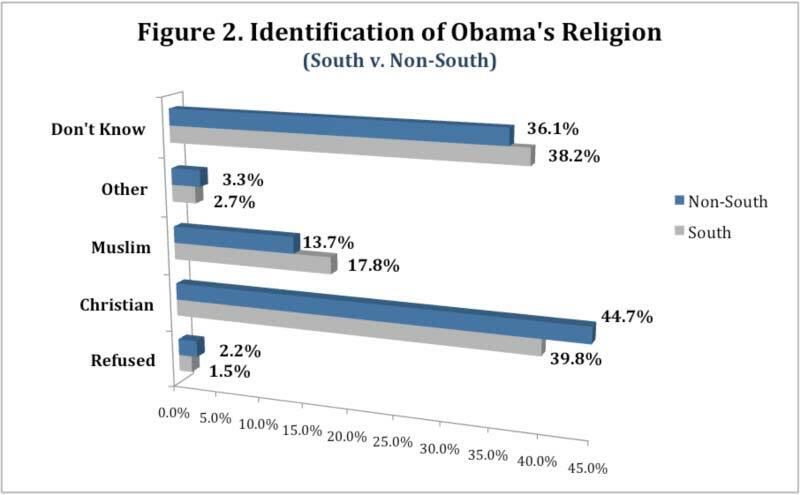 And more southerners do identify President Obama’s religious affiliation as Muslim, as opposed to Christian (Figure 2). However, when asked whether it was important to be White in order to be considered “fully” American, 64.8% of southern whites and 70.9% of non-southern whites claimed it was “not important.” Thus, the higher disapproval rating of Obama by southerners could be racially motivated, but it may also be influenced by perceptions (even incorrect perceptions) of Obama’s religious views, as well as by party identification and ideology. As previously mentioned, the Blair-Rockefeller Poll includes weighted oversamples of not only southerners, but also African-Americans and Latinos both in the South and the non-South. While the lack of data on southerners has made it difficult to accurately assess the region, the lack of data on the racially diverse South is scant at best. Surprisingly, the Blair-Rockefeller Poll even finds that a greater percentage (54.3%) of African-Americans actually identify as “Southern” as compared to white southerners (51.7%). This finding alone requires scholars to rethink regional characterizations. Thus, while little distinction may remain between the South and the non-South as a whole, clearly enormous gaps still exist among Whites, African Americans, and Latinos both in the South and outside of the South (Table 4). Whites and Latinos both in the South and outside of the South are most opposed to raising taxes to reduce the deficit, and both groups disagree at greater rates than African Americans that the stimulus money is helping the country. Whites and African Americans (irrespective of region) are more likely to be opposed to gay marriage than Latinos, but a higher percentage of Latinos agree with a strict pro-life stance on abortion. Such findings are notable because they confirm that socially conservative issues may influence racial groups differently. *only half of the respondents answered this question. The remainder were asked the same question in a different format as part of a separate research experiment. In 2008 Obama became the first Democratic presidential candidate in recent history to win an electoral college majority irrespective of his southern victories in North Carolina, Florida, and Virginia. However, the Blair-Rockefeller Poll reveals that Democrats could make additional inroads into the South by activating self-identified Democrats, particularly Latinos who report that they did not vote in the 2010 midterms. Though limiting the sample to southern Democrats who did not vote in 2010 clearly reduces the number of observations, the findings are still useful, particularly since the overall comparison reveals a shrinking gap between the South and the non-South on a host of issues. The largest categories of Southern Democrats who did not vote in 2010 are aged 30-44, women, Catholic (Baptist was a close second), and Latino. These non-voting Democrats in the South appear split on religious and socially conservative issues, with 45.6% reporting to be Biblical literalist, yet 36.6% (the largest response) are pro-choice. Perhaps most significantly, this subgroup shows no preference (neutral) on such major issues as health care and the economy (Table 5). If Democrats want to ensure competition in the South in 2012, they will have to find a way to energize this portion of their base, especially since the national sample (as shown in Table 2) reveal s a 5.2% gap in Democratic outreach between the South and the Non-South. **Only half of the respondents answered this question. The remainder were asked the same question in a different format as part of a separate research experiment. The Blair-Rockefeller Poll is a national survey that was fielded immediately following the November 2010 midterm elections. The Blair-Rockefeller poll was administered by Knowledge Networks (www.knowledgenetworks.com), an internet bases survey company that includes a representative sample of Americans in its proprietary data base including representation of the roughly 30 percent of U. S. households that do not have internet access. In addition, it covers the growing number of cell phone only households (recently estimated at 23 percent of all households) thought address-based sampling. The survey probed national and regional issues of concern to the population of the United States and was conducted in both English and Spanish. The average survey took 21 minutes to complete. The 2010 Blair-Rockefeller Poll included a total sample of 3,406 individuals, who were 18 years and older. This included 1,649 White, Non-Hispanic respondents; 825 African Americans; and 932 Hispanic Latinos. In regional terms, there were 1,689 respondents living in the South and 1,717 respondents living outside the South.